How long should you let your deer hang before cutting up meat? That’s a tough question. The best answer is, it depends. A lot of hunters in southern states skin and gut their deer in one step. From there, they cut meat off the bones immediately to get it cooled down as quickly as possible. This is known as “cooler aging”. It’s simply too warm to hang deer so the meat is packed and cooled off after it’s removed from the carcass. In most cases, hunters prefer to hang their deer to age the meat. After recovering the animal, take pictures and then begin field dressing the animal. Some people prefer to get a deer back to camp before gutting. I would only suggest this if there is a strong possibility the body cavity could become wet or dirty when transporting it out of the field. Even in those cases, it is important to remove the entrails as soon as possible. If you hunt deep in the woods, carry a small tarp to wrap your deer in when dragging it out. The tarp will not only keep the cavity clean, the deer will drag easier. Once you get the animal back to camp, you’re going to want to hang it. A lot of hunters hang their deer by the neck or antlers. This is a bad idea. Not only will you damage the cape, you could spoil the meat. The point of hanging the deer is to cool it off. 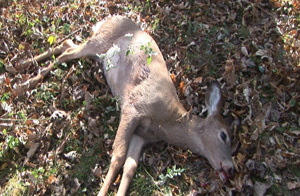 Heat rises and when deer are hung by the neck, heat is trapped inside the body cavity. The hocks on the hind legs provide an opportune place for gambrel hooks. Hanging the deer from the hind legs allows heat to escape and makes it much easier to skin and butcher the animal. Skinning the deer immediately speeds up the cooling and aging process. One of the most important factors in the aging process is temperature. Ideal temperature is between 32 and 45 degrees. Warmer and the meat will spoil, cooler and the meat will freeze. You want to hang deer in a spot where cats, dogs, and other critters can’t get to it. Barns and pole sheds are popular spots, but again be sure the area is secure. The best place is a commercial meat locker. Temperatures are constant and worries about other animals are non-existent. What do you do if it’s warmer than 45 degrees and a meat locker is not an option? Even if the temperature is in the 50s, the carcass will cool off about 50 degrees. Letting a deer hang for about 24 hours will allow the muscles to relax and the meat to cool. Ideally, a deer should hang for five to seven days. However, removing the tenderloins right away and the backstraps within 24 hours is a good idea. When the meat ages, a hard membrane will form around the meat, which should be removed when processing the meat. If you leave the straps and tenderloins on the carcass, they will dry up. Remember aging venison is a luxury, not a requirement. If temperatures are ideal, aging will take your venison to the next level. However, if the meat is in danger of spoiling it’s best to process it within 24 hours.